Note: This is my second “delayed” post about a fishing trip I made to the Steamboat Springs area and the Frying Pan River September 19 - 27. It’s Saturday and our first full day of fishing. Rather than deal with the possibility of weekend crowding on the more popular area rivers, my Michigan friends and I have chosen to fish a meadow stream about 50 miles from Steamboat Springs. The stream isn’t unknown at all, but when we get there we see surprisingly few anglers fishing it. It might be that several nearby reservoirs are the bigger draw for most fishermen or maybe they’re just not up for the short, but steep hike down to the stream and the obligatory grunt back up to their vehicles when their fishing day is over. The necessity of the hike doesn’t change my opinion. I’m all in. The water looks beautiful. The details of its meandering course include a few beaver ponds that back portions of it up into long, still slicks. Between the beaver ponds are riffles and pools. Where the gradient is steep the stream narrows down and runs through short canyons in a series of plunge pools, tiny slicks and unfishable whitewater. The scuttlebutt is that the stream holds brookies, browns, cutthroats, whitefish and maybe rainbows or cuttbows. We’ll see. We start by splitting our group up. 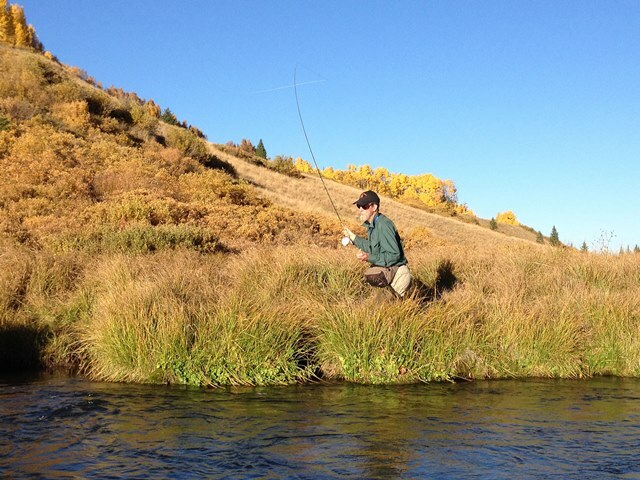 Seven fly fishers are too many, so three of us decide to drive a little farther upstream. Later, we’ll all meet up again for lunch. My group parks in the next pullout up the road where we see a beaver dam and the still water behind it. Riffles and pools break up the water’s surface downstream of the dam and after that it plunges into a narrow canyon. I decide to walk to the narrow canyon because it looks like a place most fly fishers wouldn’t venture to, especially with all the more enticing and easier to fish water above and below it. It’s a bit of a hike, but once I get to the downstream end of the canyon I’m rewarded almost immediately when a nice brown trout attacks my Elk Hair Caddis. I catch several more nice browns and a bunch of brookies as I fish my way upstream. One of the brookies is about 11-inches long. It’s the kind of water where every place you think a trout should be, there is a trout. You can catch that trout if you can make the cast and get a drag-free drift. It’s well into the afternoon when I meet up with the other guys in my group. They report catching fewer, but larger trout up near the beaver pond. We’re hungry and thirsty, so we decide to hike back up to the truck and drive down for lunch with the other group. We’re surprised to see that they haven’t moved at all from where they started fishing. The bent rods are all you need to see to explain why they haven’t moved. It turns out they decided early in the day that for the most part their dry fly and dropper rigs weren’t going to cut it, so they switched over to nymphs and were cleaning up. Here’s the real kicker. The section of the stream they had chosen to fish seemed different in a very subtle way from the water we’d fished just upstream from them. On the surface the meandering stream course looked the same, but there were deeper drops leading into the bends. Those drops were loaded with trout. After lunch we all nymphed that section and we all kept catching trout. We were rewarded later on with what appeared to be a hatch of Blue-winged Olives, but I can’t be sure because none of us ever solved it. We didn’t get a single take. You may be wondering why I said “rewarded’ by a hatch when none of us hooked up. The answer is easy. It means we’ll have to come back to this little stretch of meanders and figure out what they are taking.